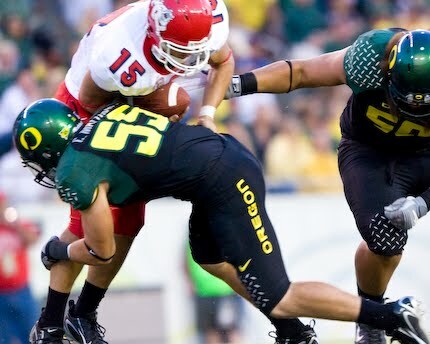 Sure Jeremiah Masoli is done in an Oregon uniform. And the Ducks lost running back LeGarrette Blount and tight end Ed Dickson. But they do return 20 starters. At the quarterback position the Ducks hope that senior Nate Costa will replace Masoli. LaMichael James played great filling in for LeGarrette Blount last season. Costa's options are very limited though. Ed Dickson was more of a wide receiver than a tight end. This leaves the job to Davis Paulson at end. On defense the Ducks are reeling from the loss of talented safety T.J. Ward. But they do have some defensive stars including defensive end Kenny Rowe, a senior. The linebackers are pretty loaded. Casey Matthews returns after snatching up an All Conference Selection, with Eddie Pleasent and Spencer Paysinger. In the secondary sophomore John Boyett will replace T.J. Ward. On speacial teams the Ducks lost kicker Morgan Flint but returns punter Jackson Rice. Key Games: Oct. 30 vs. USC Quick Pick: USC may not be the star of the college football world this season but they will challenge Oregon. USC wins. 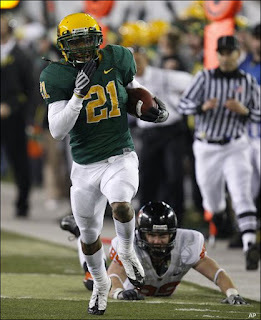 Nov. 27 vs. Oregon State Quick Pick: The Ducks defense will try to stuff up the Rodgers brothers- James and Jacquizz.